All across the western world crowdfunding is booming. Most of the success stories focus only on the financial aspect of crowdfunding, while the social impact is often neglected. Especially in densely populated and deprived urban areas, crowdfunding not only serves as a financial levier but can also be used “to produce shared goods that have value to communities” (Rodrigo 2015 – http://wiki.p2pfoundation.net/Civic_Crowdfunding). During the growfunding/bazaar, we’ll focus on the impact of civic crowdfunding on cities. Apart from Growfunding/Bxl, there are only a few other civic crowdfunding platforms which specifically focus on social urban development: La Ruche (Quebec), Patronicity (Detroit), Spacehive (London), Co-city (Paris), Voor Je buurt (a.o. Amsterdam), IdeaGinger (Bologna) and, via matchfunding, Goteo (o.a. Barcelona). Much alike Growfunding, they focus on creating a vibrant and resilient city. These urban civic crowdfunding platforms produce a specific kind of urbanity which can be referred to as ‘the civic crowdfunding city’. The latter is not limited by institutional frontiers, but can be approached as “a transterritorial city, a space built by the linkage of many different spaces in one network of quasi simultaneous interaction” (Castells 2002). All participating platform are using civic crowdfunding to create a social impact on the local level. All of them work in different cities, with different socio-spatial dynamics, different histories, different demographics, different socio-economic challenges, different policy frameworks,… Yet , the urban tissue created by civic crowdfunding might not be that different. Neighbourhoods with a large concentration of civic crowdfunding projects will have common characteristics. These commonalities are the theme of the Growfunding/Bazaar. Which kind of urbanity is created through civc crowdfunding on the long term? What are the characteristics of this city? And what are the pre-conditions to create this city? How should we coach and train project holders in order to maximise their social impact? 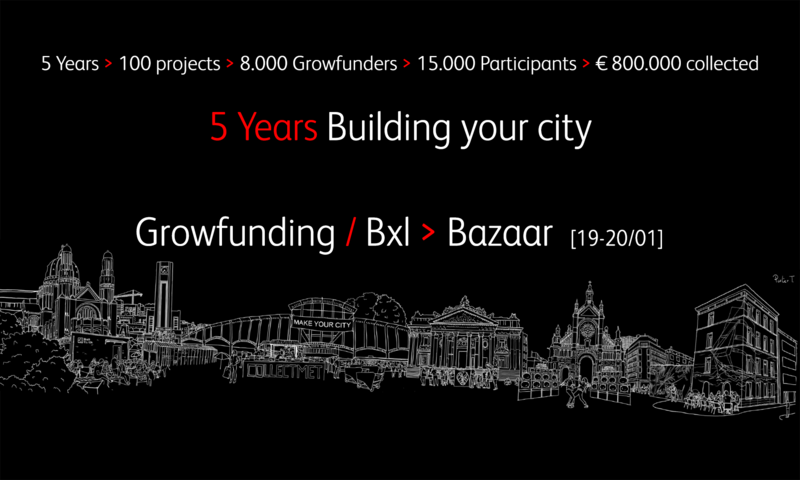 The Growfunding/Bazaar will be the kick-off in the conceptualisation of “the civic crowdfunding city”. Together with experts from the other urban civic crowdfunding platforms, academia, policy makers and civil society we will develop a theoretical framework around this new concept and launch a research agenda.